The Bruin County Gems perform before the judges at the Greater Midwest Cheer Expo Go Red Championships on Saturday at Hobart Arena. The event, which is open to the public, will continue through Sunday evening. For more information, visit www.gmce.com or www.hobartarena.com. 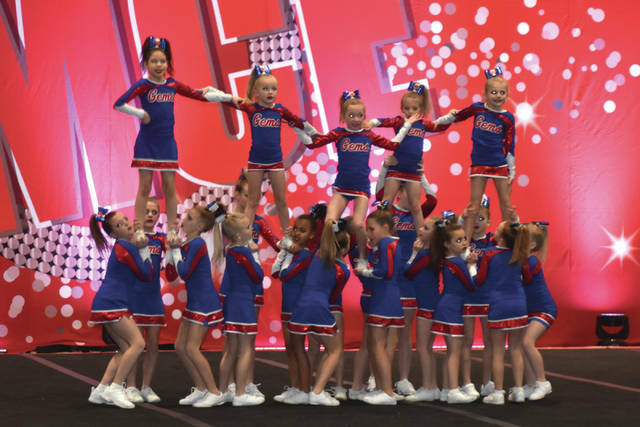 The Spectrum All-Stars, of Carmel, Ind., perform before the judges at the Greater Midwest Cheer Expo Go Red Championships on Saturday at Hobart Arena. The event, which is open to the public, will continue through Sunday evening. For more information, visit www.gmce.com or www.hobartarena.com.